Any animal loving kid is going to love these books. The theme cord is the same that runs through them. Letting your child know no matter where he/she goes or what they are doing God is with them. When the day is done and the Night is ended God will still be there to help them face what comes next. The pictures are of all sorts of animals; some are funny, come are cute and sweet. The important message though is that God is there no matter what. Visit Julie’s blogsite: http://juliecantrell.wordpress.com, where parents and teachers can find fun and developmentally appropriate activities to go along with the books. 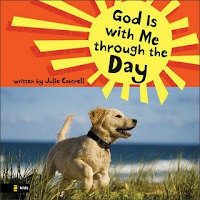 Join the Julie's facebook group, God is with Me through the Day and Night. I have a copy of God is with me through the Day and God is with me through the Night for giveaway. Leave a comment telling me which one you'd like to win. Be sure to leave an e-mail address for contact if you are the winner. I will draw a winner from those that leave a comment. Drawing will be Dec. 1st. US residents only please. Please US residents only. Be sure to leave a way for contact if you are the winner. Drawing will be held on Dec. 1st. I think my youngest would enjoy these books, she is such an animal lover. She is only nine but has already decided that she wants to work with animals when she grows up. God is With Me Through the Day would be my choice, I think the puppy is cute! I am a follower, thanks for another entry! 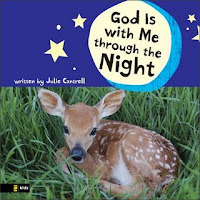 I would like to win the book "God is with me through the night" for my little granddaughter. I forgot to put my email on the first comment where I said that I would love to win the book, "God help me through the night" for my little granddaughter. I would like to win the God Is With Me Through The Day for my younger sister. Please enter me in your giveaway. Thanks! And I am a subscriber too. I would like the Through the Night. Please enter me. I have a little boy who would love God is With Me Through the NIght. God is with Me through the Night would be my pick for my little granddaughter.